On-Rail Racks are made to both safely store your SUP and also display the deck or hull. This SUP wall rack provides convenient surfboard storage for two (2) SUPs in a compact design. This rack is angled at a 45 degree angle to accommodate deep fin clearance and also keep the board as close to the wall as possible. 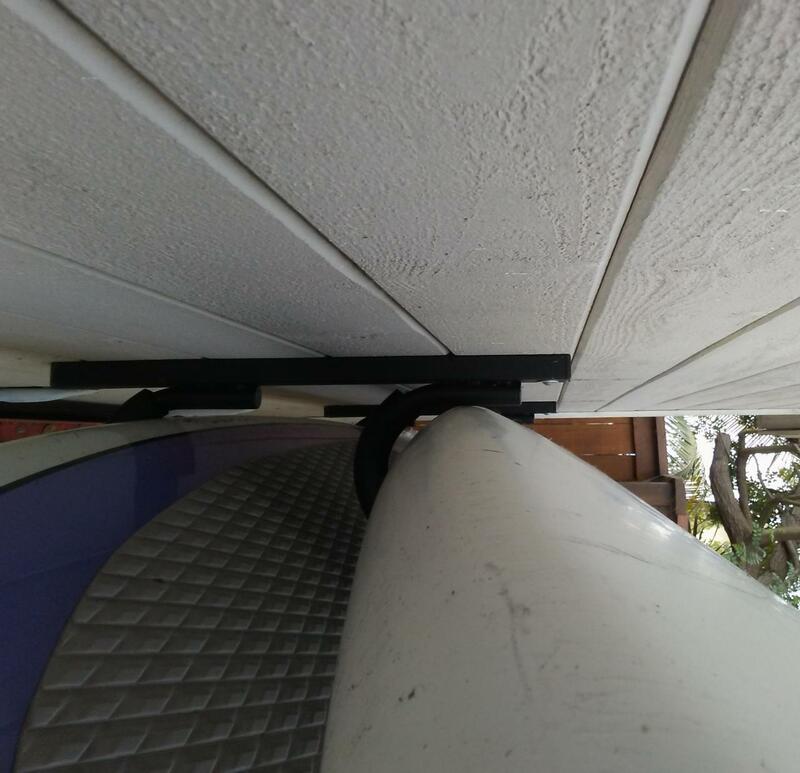 This rack has been specifically designed for SUP boards with extra clearance at the bend for the larger SUP rails. 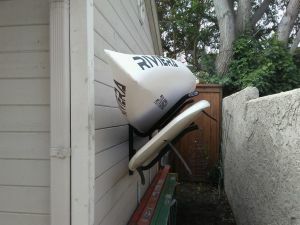 Don't just try to shove your SUP into a regular surfboard rack, get a rack designed to hold you SUP! This rack is also available in a 1 board version to accommodate your paddleboard quiver. We also have this SUP rack available in a galvanized dip finish for outdoor use to resist rust and the elements. Our double on-rail SUP racks can technically be mounted onto a dock. Note, they are not stainless steel so they will be subjected to rust and weathering with such use, and we would not recommend using them outside in a salt water location, as is. However, if you are in a salt water area, these can be special ordered with a galvanized dip that can be applied to them which would make them suitable for outdoor use in a salt water environment - should that be of interest, let us know. These are reliable, solid SUP racks, so are a good purchase, but if you want more options for outdoor use, including some dock rack options, you can find those: Outdoor SUP racks. Robust design, foam protects and easy to install! Everything detailed as promised. Installed across two fence posts (under a shady tree) and feels like a bespoke fit for two 10' paddle boards. Highly recommend. I purchased this rack for my tenant. She has two boards that we wanted to get up off the ground. I'm not sure if they are typical size (one is wide and short the other over 10 ft long) but we found it quite tight to get both boards in. The longer board actually contacts the metal of the rack directly. The foam is insufficient to protect the board fully...I tried to capture the issue in the pictures. My tenant was happy but after learning what these boards cost I would be afraid the rack could do damage to the board if you are not careful. I just bought two SUPs for my wife and I. We wanted a rack that we could use in our garage without taking up too much headspace and not get in the way of our car doors opening since we park both of our cars in the garage. This rack perfectly suits our needs and nicely displays our beautiful Vesl boards on the wall. It was easy to install. I did install them a bit higher to guarantee headspace when walking by the car and being shorter I do have to use a small step ladder to reach the top rack, but my boards are lite and it's not a big deal. The construction is very sturdy and the arms come padded with a durable foam that reaches all to the way the angle of the arm, ensuring the rail of the board is protected. Quick delivery too! We needed storage for a pair of SUPs in a tight two-car garage, and this product delivered. It's angled brackets provide for a lower wall mount while still giving adequate head room to maneuver around. The pair of brackets are quite stout with hefty lag bolts, and the padding supportive and protective for bottom-side-down stored boards. The angled storage does make lifting into position a bit dicey if the brackets are mounted too high (we had to drop by a foot after the initial mounting). Overall, we're quite pleased with the product and the price. The double SUP rack is super high quality. The construction, padding and detail is tremendous. They have been installed and work perfectly for my two 12' SUP's. Wish I had done this long ago! Worked like a champ, very easy to install, stores boards at an angle instead of flat thus taking up less horizontal space. the board racks arrived quickly and were just what i was hoping for. couldn't recommend them, or the vendor, more highly! Heavy duty and have foam protection. I store 2 large boards, 11' 6" and 12' with no issues. The SUP wall rack seems to support my boards okay so far, but I wonder what they will be like 5 years down the road. I was surprised to see how light weight the material was.